Below is the product datasheet. White, flat tablets with a bevelled edge and a break-line. For analgesic therapy in the dog only. The product is indicated for acute pain of traumatic origin, as a complementary treatment in pain associated with other conditions, and post operative analgesia. 1 tablet per 12 kg body weight every 8 hours. Small dogs (up to 6 kg body weight): Half a tablet every 8 hours. Medium dogs (6-18 kg body weight): Half to one and a half tablets every 8 hours. Large dogs (18-42 kg body weight): 1-3 tablets every 8 hours. Treat for a maximum of 5 days. Do not exceed the stated dose or the duration of treatment. Do not administer other NSAIDs concurrently or within 24 hours of each other. Use is contraindicated in animals suffering from cardiac, hepatic or renal disease, where there is the possibility of gastrointestinal ulceration or bleeding, or where there is evidence of blood dyscrasia or hypersensitivity to the product. Do not use this preparation for cats. Use in animals less than 6 weeks of age, or in aged animals, may involve additional risk. If such use cannot be avoided, animals may require a reduced dosage and careful clinical management. Avoid use in dehydrated, hypovolaemic or hypotensive animals as there is a potential risk of increased renal toxicity. Some NSAIDS may be highly bound to plasma proteins and compete with other highly bound drugs to produce an increase in non-bound pharmacologically active concentrations, which can lead to toxic effects. Concurrent administration of potentially nephrotoxic drugs should be avoided. There are no known contraindications for use during pregnancy. If you notice any serious effects or other effects not mentioned in the data sheet, please inform your veterinary surgeon. Overdose: Immediately seek the advice of a veterinary surgeon showing them the product literature. Carry out lavage and treat with an intravenous injection of acetylcysteine (200 mg/ml) at a rate of 140 mg/kg every 6 hours for 7 treatments. Ascorbic acid (30 mg/kg) should also be given orally with each dose of acetylcysteine. If necessary, instigate fluid therapy using 'Ringers' or bicarbonate solution. Treat for codeine overdosing with intravenous injections of naloxone (1.0 mg/kg) repeated as necessary. Provide oxygen support. Side effects: Occasional constipation due to codeine content. Special precautions to be taken by the person administering the veterinary medicinal product to animals: Wash hands after use. General precautions: For animal treatment only. Do not store above 25C. Do not use after the expiry date stated on the blister. Disposal: Dispose of empty packaging and any remaining product in the household refuse. Containers of 100 and 500 tablets. NSAIDs can cause inhibition of phagocytosis and hence in the treatment of inflammatory conditions associated with bacterial infections, appropriate concurrent antimicrobial therapy should be instigated. Seek veterinary advice if the treated condition does not improve or worsens during treatment. UK authorised veterinary medicinal product. Dechra Limited, Dechra House, Jamage Industrial Estate, Talke Pits, Stoke-on-Trent, Staffordshire, ST7 1XW. Below are some recent questions we've received regarding Pardale-V Tablets for Dogs, including answers from our team. We have been prescribed these by our vet for on and off hip pain in my 3 yr old collie x. They seem to suit him and his stomach although he does seem a little sleepy. Is this a normal reaction? We are only on day 3, if they continue to suit him and relieve the pain I will definitely be purchasing them and keeping our medicine pack topped up. Tiredness or lethargy are not side effects usually associated with Pardale V and I would be surprised if it is these tablets causing the sleepiness. That said individual dogs can react differently to any medication so it is not impossible. The only real way to tell would be to stop the Pardale and see if he becomes brighter. If it is in fact the Pardale causing the tiredness then you need to decide if the benefits of the medication (ie pain relief) outweigh the negatives (lethargy). There are other NSAIDs that you could speak to your vet about trying. My vet and your blurb state that Pardale v should only be given for5 days but can be taken again after a suitable break.How long is a suitable break please? It is hard to suggest a "suitable break" and depends a little bit on the dog. A sensible amount of time would be around 2 weeks. However if you felt your dog required another course before then I would probably give it as the risks are small and it is important to keep your dog comfortable. Some dogs are in fact on Pardale-V longterm without problems. If your dog gets any vomiting or diarrhoea you should stop the tablets though. My vet says it's more a matter of keeping my old15 year old goldie happy now but for me old habits die hard.Is Pardale v a safe drug to give with Metronidozole?He often has these because of upset tum. Pardale-V (an anti-inflammatory painkiller) and Metronidazole (an antibiotic) are different classes of drug and generally considered safe to use alongside each other. However, as with many effective drugs there are sometimes side effects seen with longterm use of Pardale-V. Most often liver damage with some dogs seeming to be more susceptible than others. It is possible to monitor any damage to the liver with 6 monthly (or more frequently if you prefer) blood tests done by your vet. In dogs struggling in old age it is generally considered that an improved quality of life on anti-inflammatory painkillers outweighs the risks of side effects. Can this drug cause hyperactivity? I have a fifteen year old collie cross who is on Pardale-v for Ten days but the vet has talked about leaving her on it with her Loxicom which she takes regularly . After reading the comments I Believe her body is to old to handle the drug on a permanent bases . Pardale-V is a safe drug if used carefully and sensibly. Like many drugs it does have potential side effects but if your dog is on an appropriate dose and your vet has ascertained that there are no underlying conditions which affect it, the risks are very small. It also works well in combination with Loxicom and has the potential to greatly reduce the stiffness and discomfort your dog might otherwise feel. Dogs tend to suffer in silence but that does not mean they do not want to be made more comfortable. It is up to you and your vet, but I would be inclined to give it a try and see how your dog gets on. You should stop both medications if your dog starts to have any vomiting or diarrhoea or goes off her food, but otherwise I would give it, regardless of her age. Obviously this is really a question to direct at your own doctor. However the active ingredient is very safe to use in people (and at a higher dose than that) so I doubt if there are any concerns. Can these tablets be given alongside to a dog who is on steroids for allergies? These tablets are not recommended to be given with steroids. Although they are generally safe, that is a combination which might well cause problems, so I certainly would not do it. 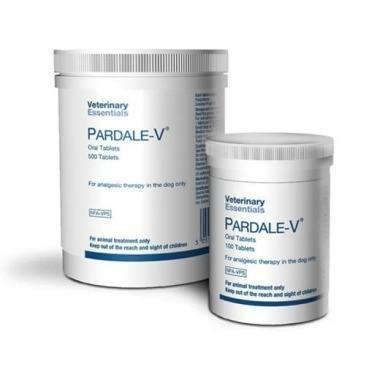 My Labrador has been prescribed x3 pardale v daily for 2 weeks post hip operation. Is this ok as I noticed suggestions not use for more than 5 days? Should he use alternative pain relief? This is a safe product for dogs, though there is potential for it to build up in the body over time, especially if accidentally over-dosed. The guidance you refer to is sensible for general situations. If your vet has prescribed this dose in full knowledge of your own dogs bodyweight and general health, then I would expect it will be safe and effective. There are other medicines which could have been used so I am not sure I would have suggested Pardale-V myself, but it does have good qualities. It is of course OK for you to question your own vet about it. Pardale-V tablets are very safe if given for just a few days. If they are used continuously for longer periods then side effects are possible and are usually vomiting/diarrhoea but can relate to liver or kidney damage. This is something you should talk to your own vet about. There are other treatments to help with arthritis which are much more modern and potentially better than Pardale V, though they are more expensive. My Staffordshire bull terrier (Buster) has been prescribed half a tablet (pardale v) to treat a pain in his neck, either a muscular or disc problem. Looking at your website it suggests 1 tablet per 12kg bodyweight every 7 hours, Buster weighs 25kg so that suggest 2 tablets every 7 hours. Buster does suffer with acidity in his stomach are these tablets likely to make it worst?. Many thanks. Your vet has prescribed a dose which is lower than that generally recommended by the manufacturers. I would presume that your vet has good reason to do this and so I would suggest you do not go against that without talking to your vet about it first. These tablets can be associated with stomach and other problems, and if given at the full dose, a maximum of a 5 day course is recommended at a time. The higher the dose and the longer they are given for, the greater the chances of some unwanted side-effect. They can be very helpful and effective though if used carefully.